The air of velocity 15 m/s and of density 1.3 kg/m3 is entering the Venturi tube (placed in the horizontal position) from the left. The radius of the wide part of the tube is 1.0 cm; the radius of the thin part of the tube is 0.5 cm. The tube of shape U connecting wide and thin part of the main tube (see the picture) is filled with the mercury of the density 13 600 kg/m3. Determine the height difference that stabilizes between the surfaces of the mercury in U-tube. 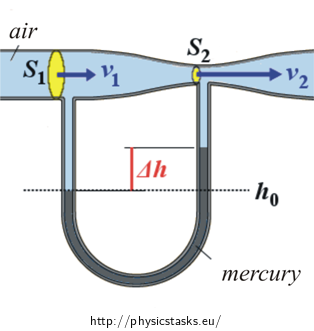 What causes different heights of mercury in the arms of the U-tube? The cause of height differences is the separate air pressure above its surface. In the left arm the pressure air p1 is higher and is pushing the mercury lower into the tube. On to the contrary the pressure air p2 is lower in the right arm and the mercury can rise higher. Can you interconnect mathematically the separate air pressure in the arms of the U-tube with the found difference Δh? Examine the size of the pressure in the lower level of the surface h0. where ρ2 is the density of the mercury and g is the gravitational acceleration. Now we will determine the pressure differences in the numerator of expression (2). Express it from Bernoulli’s principle which describes the steady flow in the main tube, and substitute it into relation for Δh. What quantity from relation (5) do we have to find out yet? Use the equation which describes steady flow fluid and the quantity which we are looking for will be found in the equation. Express this quantity and substitute it into relation (5). The difference between the levels of height of mercury in arms of U-tube is approximately 1.6 cm. Difference between the heights of the surfaces of mercury in the arms of U-tube is approximately 1.6 cm. In practise the Venturi tube is used in planes to measure the flight velocity. It provides more exact measurement than for example the common Pitot tube but it is intended rather for smaller flight velocities – the speed of sound is reached in the thinner part at small velocities.